It’s Bank Holiday Monday and I have the blues. Having returned from holiday I can’t get on with anything – even crafting! I am joining in a Crafting Q&A by Nothing But Knit! to try and inspire me. 1.Do you have a favorite crafting tool? Currently slightly in love with my new tape measure – it’s pistachio green, lives in a clear circular pot with a lid, purchased in a French market. 2. Which do you prefer when you craft: listening to a podcast or music, watching something on tv or silence? 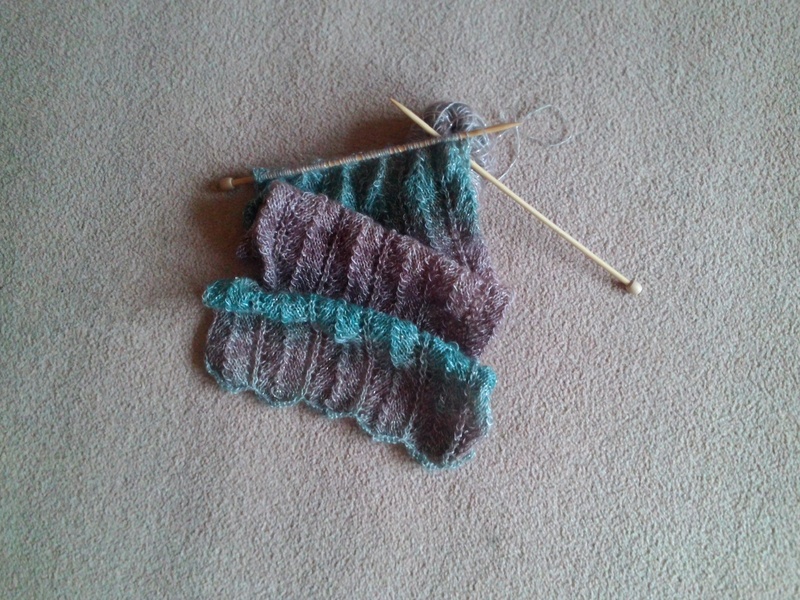 When knitting something simple, I like the tv on. When sewing with my machine, I love to go through my cd collection and often find myself having a sing song along. 3. Do you have a favorite designer that you’d like to recommend? Not really. Sorry! I would love to have one but choose designs by pattern rather than designer. 4. Most people have a favorite color, do you find you use it more than other colors? Is there a color you avoid? Why? I use a lot of green when knitting and sewing – usually bold and vibrant, though not neon and definitely not sludge green. I usually avoid black as it is harder to work with if the light isn’t good. I recently tried knitting with black with silver glitter running through it and I still struggled to find dropped stitches and count rows! It became an abandonned project! 5. Have you experienced a crafting injury? If yes, what. As most knitters, RSI wrist injury from ‘just doing one more row’. We all know how to sit properly and to take breaks but sometimes you’ve just gotta keep knitting! Can I add a different craft style ‘injury’ ? My poor car had a hole in it’s upholstery from a knitting needle – my craft bag got squashed into the back of a seat and punctured the leather. This entry was posted in Uncategorized and tagged FROGGED, knit, needle, sew.